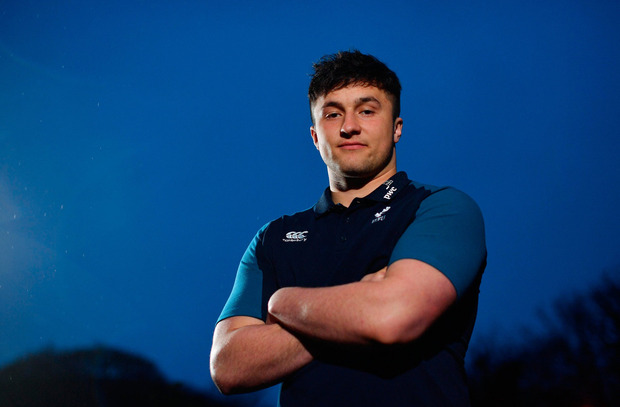 Given that Thomas Clarkson wasn't expecting to be the first-choice tighthead for this year's Ireland U-20s, it's fair to say that he most definitely didn't reckon that he would be the cornerstone of an unchanged pack for all five Six Nations games. Clarkson is one of the few players in the squad who is underage again next year, which makes his impressive displays at scrum time all the more remarkable. The former Blackrock student will be central to Ireland's hopes of clinching the Grand Slam against Wales in Colwyn Bay tomorrow and their chances are significantly boosted by having both Harry Byrne and Craig Casey available. Out-half Byrne missed last week's victory over France with a hip injury, while scrum-half Casey, who was forced off with a nasty-looking knee injury, has made a rapid recovery. That means Byrne is the only change from last week's team with Ben Healy unlucky to be dropped to the bench. "Noel Mac (Namara) said that after the last game at 18s, he said he could really see us going on to being successful - I found that hard to imagine then," Clarkson admitted. "After Fota is when it really came together for me. We seemed like an actual team. "Before that, we were people trying to gel. In Fota, we really came together. I felt it really as a team going into England. We've launched 24 out of 24 scrums. That's a pretty good stat." IRELAND U-20s (v Wales) - J Flannery; A Kernohan, L Turner, S French, J Wren; H Byrne, C Casey; J Wycherley, D Tierney-Martin, T Clarkson; C Ryan, N Murray; M Moloney, S Penny, J Hodnett. Independent.ie Newsdesk Munster have distanced themselves from a spectator who confronted Billy Vunipola on the pitch after the Champions Cup semi-final at the Rioch Arena in Coventry.